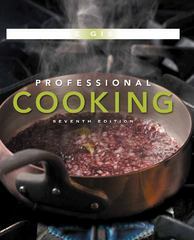 Professional Cooking 7 Edition This is the best-selling undergraduate food preparation textbook in the marketplace. It has a long standing reputation for being comprehensive, yet easy for students to understand and follow. Wayne Gisslen's reputation for being able to simply, yet comprehensively, communicate information to beginning chefs is unsurpassed. Professional Cooking, Seventh Edition includes videos that will help further illustrate the correct techniques in the kitchen. On top of that there are over 100 new recipes, some with particular emphasis on international cooking. Enhanced visual program includes over 220 new color photos, including plated dishes, procedures, and products. Approximately 100 new recipes have been added, for a total of 650 recipes plus another 600 variations. More focus on international recipes and variations. Enhanced topical coverage on such things as: food science, molecular gastronomy, international recipes, and culinary maths. Chapter 10, Understanding Meats, now includes all information on meat fabrication in one convenient place. Up-to-date nutrition guidelines. Thoroughly revised and enhanced Culinar E-Companion Recipe Management software contains all recipes from the book – and 90 bonus recipes. The software is available through download with the registration code in the back of the book.